The truth of the matter is, everything looks better in Rainbow, and it is visually appealing and stimulating for Buddy too! So, to utilise my current obsession productively, I decided to create a series of Fun Rainbow plays to share with you all. A one stop shop for Rainbow Fun. So sit back and enjoy folks! Discover colours and letters with this Rainbow Rice I-Spy from You Clever Monkey. Children can have a great time creating these Sensory Rainbow Cereal Discovery Bottles. Practice crushing and pouring too! Make Music and enjoy the beautiful colours in these Rainbow Sensory Musical Shakers from My Little 3 and Me. These beautiful Rainbow Scavenger Hunt Bottles from Fun at Home with Kids will inspire even the littlest imaginations. Babies and Toddlers will love the colours and textures of these Rainbow Sensory Bottles from No Time for Flashcards. Get stuck into this wonderfully colourful Rainbow Spaghetti Play. A great taste safe activity for kids of all ages. This Rainbow Sludge from Fun at Home with Kids is a fantastic sensory art play. Explore the Rainbow with these Taste Safe Rainbow Water Beads. These feel absolutely fantastic and are safe for even little explorers. These amazing Soap Foam Bubbles from Fun at Home with Kids look almost good enough to eat (don’t taste it though!) A great messy sensory bin. Why not make some Rainbow Clean Mud like Frogs and Snails and Puppy Dog Tails. Not only does this look fantastic, the ingredients will make it smell amazing too! I absolutely love this Shaving Foam Rainbow from And Next Comes L. As soon as Buddy stops tasting, we’ll be trying this! This Rainbow Chickpea Sensory Bin from And Next Come L looks amazing and would be great for scooping and sorting activities. Buddy loved playing with these Rainbow Oats, perfect for scooping, pouring and digging! This Rainbow Rice from Happy Hooligans is just too pretty! I could play with this all day. Don’t these Sparkly Rainbow Crystals from Twodaloo look simply magical? They would also make perfect fairy dust! Make beautiful patterns and swirls with this lovely Rainbow Shredded Coconut from And Next Comes L.
There is something quite magical about this Rainbow Snow from Blog me Mom. I can only describe this Fruit Loop Sensory Bin as groovy! Funky colours and taste safe too, a great idea from Love Play and Learn. This Rainbow Barley Sensory Play from Twodaloo looks so inviting! I can’t wait to make our own. Stack and learn with this lovely Rainbow Sensory Bin from Little Bins for Little Hands. 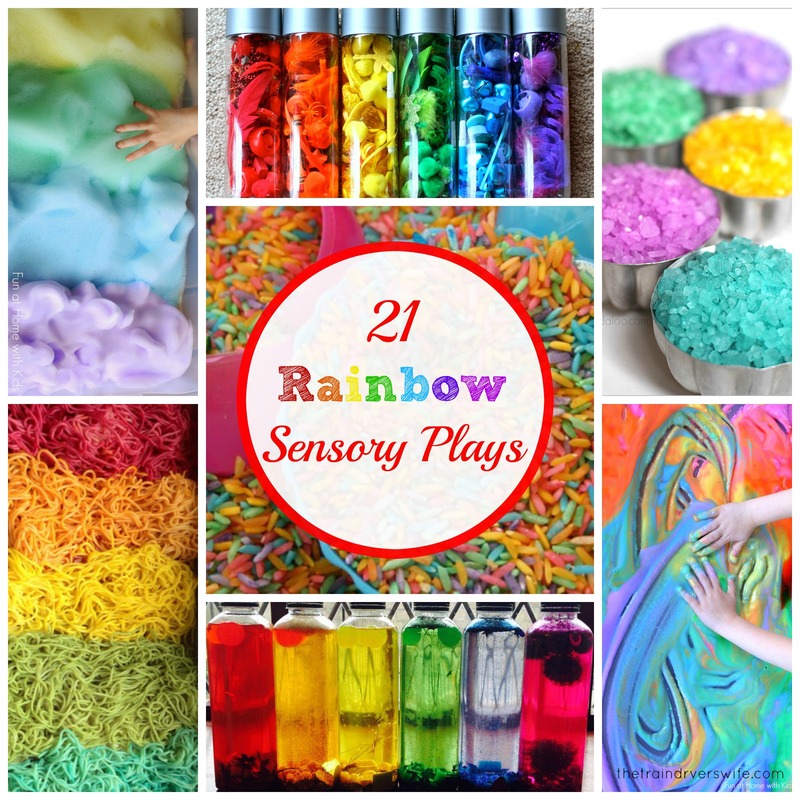 I hope you have enjoyed reading this Rainbow Sensory Round-up as much as I enjoyed creating it. If you are craving more Rainbows in your life, be sure to come back and check out our upcoming Rainbow Activities, Slimes, Dough and Crafts. I love reading comments and appreciate any feedback so please feel free to leave me a note in the comments section below.